I was reading Thomas Jefferson last week. Since I have admitted my visceral dislike of Jefferson before, you might well ask me why I would put myself through this. The answer is that as despicable a human being as he was, he was actually a very talented writer. Furthermore, his was the kind of genius ever-fruitful in ideational freaks and monsters, stillborn thoughts sent into this breathing world scarce half-formed. Such thinkers can make for breathtaking reading precisely because of their many fantastical and audacious errors. Jefferson was among the first of learned fools. As such, he is fit inspiration for Tea Party ideologues, who may find in his voluminous writings authoritative backing for just about any half-witted theory they care to march in support of. I’ll also grant Jefferson this much: despite the palpable idiocy of some of his ideas, he clearly took them seriously. He was not merely playing at ideas, which is why his Federalist enemies considered him such a dangerous lunatic. The speech is addressed to “THE SENATE AND HOUSE OF REPRESENTATIVES OF THE UNITED STATES IN CONGRESS ASSEMBLED”. Washington would typically begin his addresses with a single reference to his “fellow-citizens”, and that would be all. Jefferson’s successor, James Madison, did likewise. John Adams was even more formal, directing his Annual Addresses to the “Gentlemen of the Senate and Gentlemen of the House of Representatives”. By contrast, Jefferson is conspicuous in his habit of beginning almost every paragraph with addressing his “fellow-citizens”. This is likely a conscious affectation, an expression of his Democratic-Republican principles, setting him apart from his “monocratic” Federalist predecessors. “Violations of human rights” has a peculiarly current ring to it. I have had difficulty pinpointing the first use of the term “human rights” (as opposed to, say, “natural rights” or “lawful rights” or “the rights of man”). One source tells me the term emerged sometime between 1785 and 1795, but fails to cite a source. Wikipedia does provide a source, but with a much later date of 1831. In any case, Jefferson’s is certainly a very early — if not the earliest — reference to “human rights”. Whether it was or wasn’t in the best interests of the United States to ban the importation of slaves, it was certainly in the best interests of Jefferson’s home state of Virginia. With external supplies of slaves stopped, those states — like Virginia — that had a surplus of slaves stood to profit greatly by selling them to the new territories opening up in the West. With the African slave trade abolished, Jefferson’s own slaves would have a much higher market value. And being heavily indebted to British merchants, Jefferson badly needed the extra income that he could derive from breeding and selling his “stock” of slaves. Article I, sec. 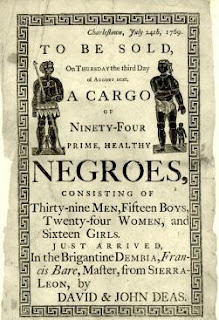 9 of the Constitution reads: “The migration or importation of such persons as any of the states now existing shall think proper to admit, shall not be prohibited by the Congress prior to the year one thousand eight hundred and eight, but a tax or duty may be imposed on such importation, not exceeding ten dollars for each person.” This clause protected the slave trade from federal prohibition for twenty years, until 1808. However, Congress passed a bill abolishing the slave trade on March 2, 1807, and Jefferson signed it into law the following day. It could not go into effect until January 1, 1808. The reference to “such persons” rather than to “slaves” was typical of the Constitution’s language. The most egregious example of this is Article I, sec. 2, the infamous “three-fifths” clause, which stated that representation in the House of Representatives was to be “determined by adding to the whole Number of free Persons, including those bound to Service for a Term of Years, and excluding Indians not taxed, three fifths of all other Persons.” This grossly circumlocutory and Orwellian phraseology replaces the word “slaves” with “all other persons”. It also made a mockery of the term “person” as a legal concept. I cannot but help wondering what form such “notice” took. Since the federal government would be unable to prevent importation of slaves for another year at least, what measures were to be taken in the meantime? Notices posted at ports? Advertisements in trade newspapers? A friendly warning from customs officials during port inspections? Jefferson’s recommendation here is willfully vague, which leads me to suspect he had no concrete plan for this. Or perhaps, as a believer in a weak executive branch, he thought such action fell more properly within the legislative sphere of Congress? After all, Article I, sec. 9 refers to prohibition “by Congress”. By the nineteenth century, the middle passage of the Atlantic slave trade could take around six weeks, but this could vary greatly depending on the weather. However, the entire triangular trade route voyage would obviously take much longer.